Video Chat — For Real This Time! A miscommunication last month over at Coffee Time Romance left Leanna Renee Hieber, Suzanne Lazear, and me watching tumbleweed in an empty online chatroom. This Sunday at 2pm EST, fellow Mermaids Robin Covington, Avery Flynn and I are going to try it again…this time on video! We’re co-hosting (with Bewitching Book Tours), so there’s no mix-up. 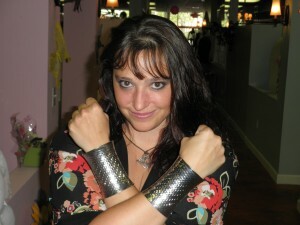 And there will be prizes…like a signed ARC of ENCHANTED! Avery’s written up the deets for us here — be sure to spread the word. The more the merrier! Have you ever wanted to see a Waterworld Mermaid in her natural habitat? Chat about books in the lagoon? Ask questions about our latest releases and upcoming novels? 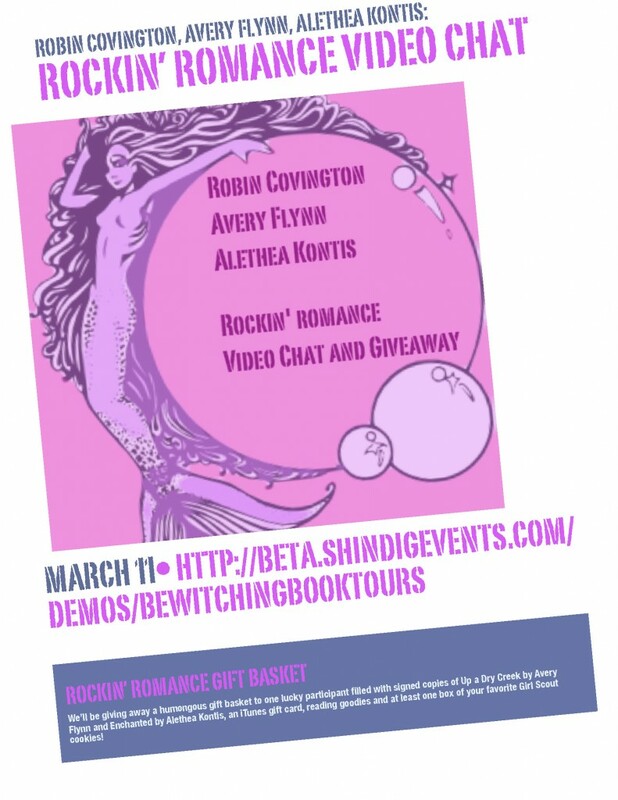 We’ll be giving away a humongous gift basket to one lucky participant filled with signed copies of Up a Dry Creek by Avery Flynn and Enchanted by Alethea Kontis, an iTunes gift card, reading goodies and at least one box of your favorite Girl Scout cookies! What’s that? You’re evil twin is planning to take over the world this Sunday by destroying all the bookstores on the Eastern shore so you can’t make the chat? Totally understandable. Leave a question or suggest a conversation topic in the comments below and you’ll be in the running for the Rockin’ Romance gift basket. Participating in the video chat is easy. 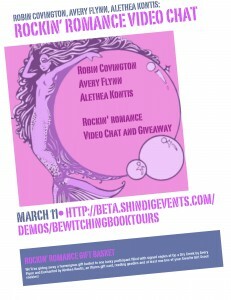 Just visit http://beta.shindigevents.com/demos/BewitchingBookTours at 2 p.m. Sunday and follow the onscreen prompts. All you need is a a web cam, a love of romance novels and a sense of humor. We can’t wait to chat with you in the lagoon!